Kyushu is a mythical, mysterious wonderland of sights that exceeded my wildest dreams. With active volcanoes, beaches and natural hot springs, it is definitely a destination to put on your list. Relatively unknown to Australians, Kyushu is the most southwestern of Japan’s main islands. It has a mostly subtropical climate, so in winter it’s not as cool as the northerly islands, such as Hokkaido. Beppu, in the Oita prefecture, is home to more than 2,000 onsen (hot springs.) It’s also home to the famous “Hells of Beppu”. There are seven hells (jigoku) in total, and I was lucky enough to visit three of them. 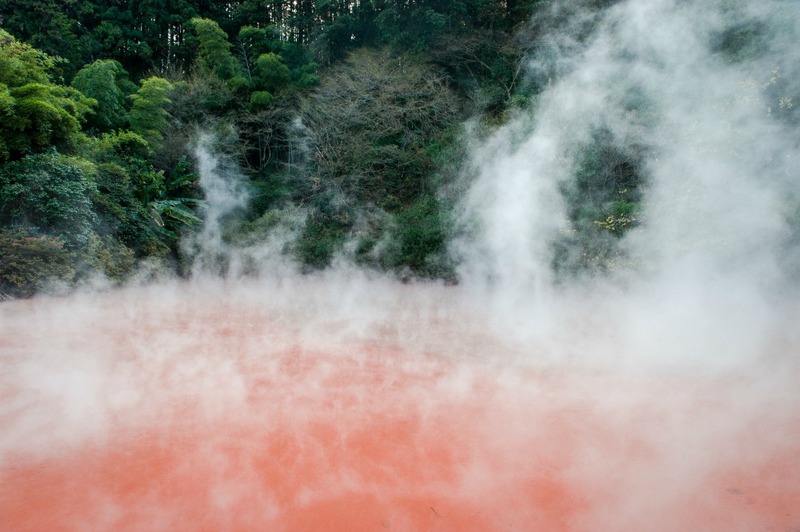 The first is Blood Pond Hell (Chinoike-Jigoku), named for its red and extremely hot waters (approx 78°C). The area is wheelchair-friendly and easy to get about for an older person. Next door is Shaven-Head Hell (Oniishibozu-Jigoku), where the bubbling hot mud look like the shaven heads of monks. Surrounded by stunning autumn colours and green foliage, these are a true wonderland. Sea Hell (Umi-Jigoku) is steaming-hot and a deep cobalt-blue colour, and perhaps the most beautiful of all the hells. Ponds full of lotus flowers – the leaves of the plant strong enough to support a small child – abound, as do the trees of autumn colours. There are a couple of blood ponds here as well, all boiling hot. A particular delicacy at the Hells is a steamed custard pudding with caramel base that is quite delicious. Not too far away from Beppu is the town of Matama. Unbelievable sunsets can be viewed from Matama Beach and photographers from all over the world gather at this beach, all hoping for that perfect shot. A short drive to the farming community of Tashimunosho and one can see ancient rice paddies and farms nestled between the towering hills. These areas are all easily accessed by over 60s, mobile or not. There are no long hikes in Beppu. 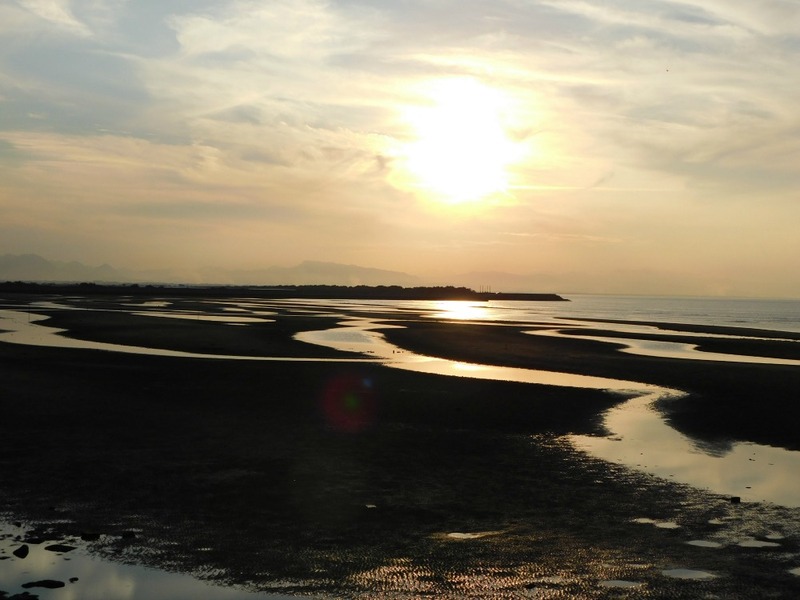 Leaving Beppu, take a train ride on the Sea Gaia to Nobeoka in the Miyazaki Prefecture. Up big mountains, along the seashore and through farming areas and small towns, this is a great trip. 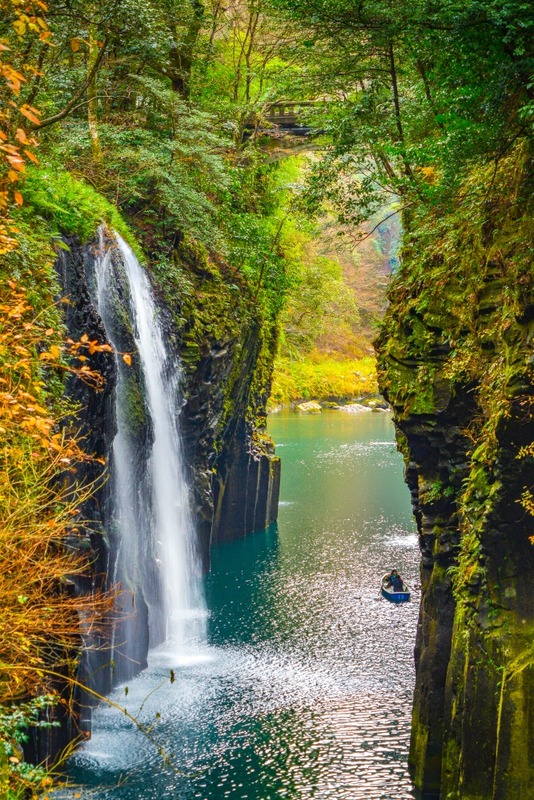 Takachiho, a town in southwest Japan, is, in my opinion, the jewel in Japan’s crown. I was in awe of everything I laid eyes on, from the deep gorges to the pristine water meandering through the Takachiho Gorge. The autumn colours on the mountainsides and along the streets have to be seen to be believed. The colours of the trees are a sight to behold, from the vibrant red leaves of the maple, a native tree of Japan and the brilliant yellow of the ginkgo, Tokyo’s symbol tree, to the-almost-as brilliant yellow of the larch, the orange-red cherry trees, the red of the rowan tree and the deep green of the cedars. 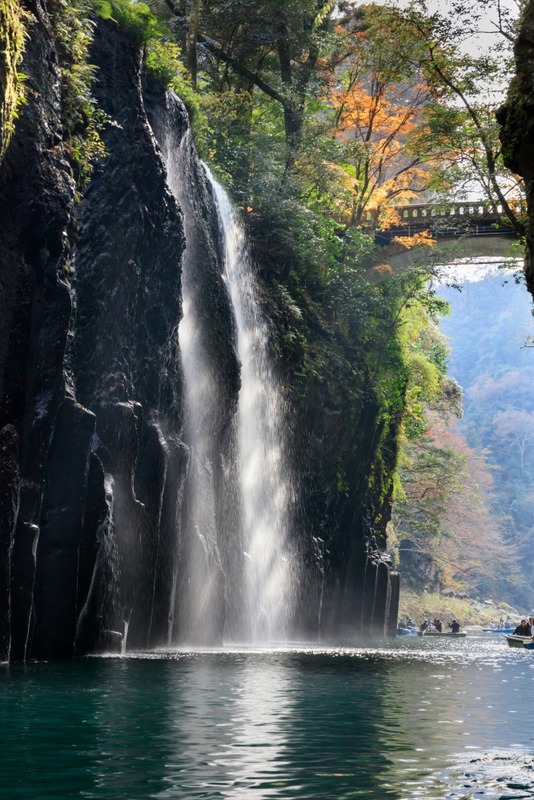 A boat trip on the crystal waters of the Takachiho Gorge to see the beautiful Manai Falls is another must-do activity. There are many steps down to the boat, so it’s not suitable for those with limited mobility, but never fear – the waterfalls can be viewed from the bridge above. Takachiho is a lovely place in which to take a nighttime stroll, with winding streets and interesting, small shops and cafes. Located on the edge of the town centre, the beautiful Takachiho Shrine, nestled between a stand of tall cedars, is the site of one of the most important legends in Japanese mythology. Amaterasu, the Shinto sun goddess, became so outraged at her brother’s cruel tricks that she hid herself in a cave and thus deprived the world of her life-giving light. A cultural performance about how the other Gods lured her out and thus restored light to the world is indeed an amazing experience. 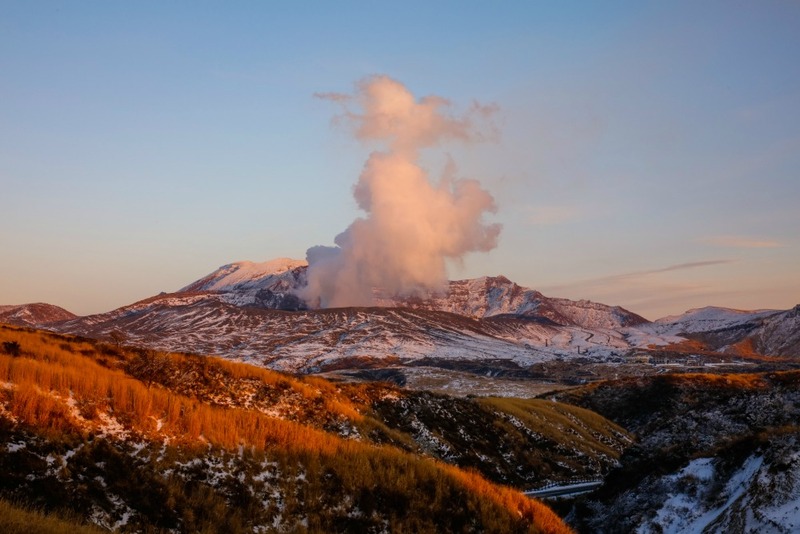 A few hours’ drive away is Mount Aso, the largest active volcano in Japan and amongst the largest in the world . It stands in the Aso Kuju National Park in Kumamoto prefecture. There’s a lookout high above the crater, and you can ride a pushbike or even a horse around the outer rim. Amazingly, the floor of the volcano is dotted with homes and farms, all very fertile because of the soil. I don’t think I would like to live down there, though – Mount Aso could erupt at any given moment (most recently in 2016). But it was still very interesting to see this place. Kyushu is thought to be the birthplace of Japan. It is where it all began, and a more amazing island I have yet to see.